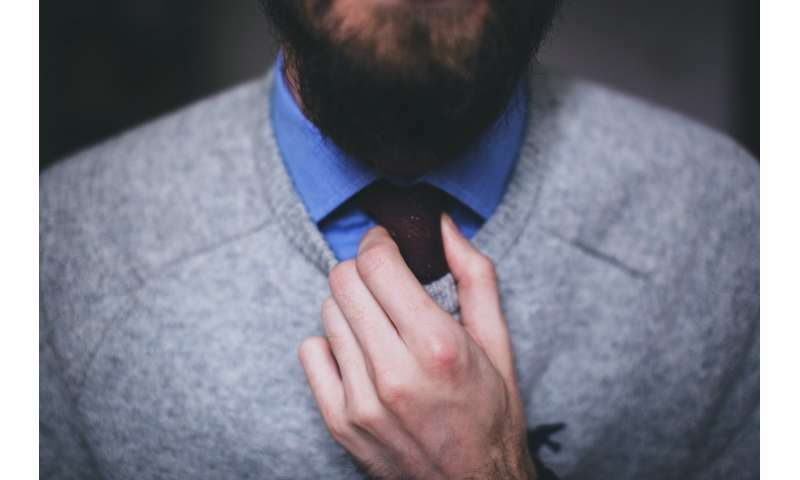 The study showed that wearing a tie that causes slight discomfort can reduce blood flow to the brain by 7.5%, but the reduction is unlikely to cause any physical symptoms, which generally begin at a reduction of 10%. Past research shows that compression of the jugular vein in the neck reduces blood flow to the brain. In this new study, published recently in the journal Neuroradiology, the researchers tested whether the pressure of a necktie could induce these changes. They recruited 30 young men aged 21 to 28 years and split them into two groups: those wearing neckties and those without. Using magnetic resonance imaging (MRI), the researchers tested the cerebral blood flow (total blood flow to the brain) using a technique that showed changes to the flow via a colour change. They also tested the blood flow from their jugular vein. The first MRI took a "baseline" scan, while the participants in both groups had an open collar (and those in the tie-wearing group had a loosened tie). For the second scan, the men's collars were closed and participants in the tie group tightened their Windsor knot until they felt slight discomfort. A third scan followed, in the same conditions as the baseline scan. All scans lasted 15 minutes. The authors found that wearing a necktie with a Windsor knot tightened to level of slight discomfort for 15 minutes led to a 7.5% drop in cerebral blood flow, and a 5.7% drop in the 15 minutes after the tie was loosened. The men's blood flow in the control group – those who weren't wearing a tie – didn't change. No change was found in jugular venous flow between the two groups. The study didn't go into any detail about the effects, so let's consider what they might be. The researchers found a reduction in blood flow to the brain of 7.5%, which is unlikely to cause problems for most men. Healthy people are likely to begin experiencing symptoms when blood flow to the brain reduces by about 10% – so, a larger reduction than the study found. Along with an increase in blood pressure at the site, a 10% reduction in blood flow can cause dizziness, light-headedness, headaches and nausea. But even with a 7.5% drop in blood loss to the brain, a person could still experience some temporary dizziness, headaches or nausea. Compounded with other factors, such as smoking or advanced age, a 7.5% decrease could bring some people over this 10% threshold of blood flow loss, placing extra stress on their already strained bodies and increasing their risk of losing consciousness or developing high-blood pressure. It's unclear why there was no change to the jugular, but this may be due to the circular nature of the restriction: the pressure is equally distributed across the neck, rather than just the jugular. Further research is needed to assess the impact of wearing a tie for longer periods and wearing different knots. Any pressure on the neck is slightly discomforting, and men's style guides advise tightening a necktie to be "tight but not too tight". Whether this tightness aligns with the participants' classification of "slight discomfort" is unclear. This study had a sample size of 30 participants, which is relatively small. Most human studies investigating blood pressure and cerebral blood flow have at least 40 to 60 participants. Another limitation is that the study did not include a discussion about the potential impact of the blood restriction, or the finding that jugular blood flows didn't change. But overall, the study is simple and well-designed. It adds to a small but growing body of research about the problems with neckties: they can lead to higher rates of infection, as they're infrequently washed; and they may increase intraocular pressure (blood pressure in the eyes) to the point of increasing the risk of glaucoma. The study only evaluated physiological changes and ignored cognitive changes and changes in cognitive ability. The unrestricted blood flow is obviously the flow the brain requires for normal functioning, after all, the blood is used for cognitive processes, not for physiological functions like cooling the blood as Descartes once postulated. With a lower blood flow you would expect peripheral attention to suffer. The peripheries are the least necessary and the first to go when focal attention is called for. Noticing whatever else is happening when you are thinking about something and multi-tasking are likely to be effected first when blood flow is restricted, that is, a person is likely to lean toward narrow mindedness, unimaginativeness, and less complete thinking when blood flow is restricted. A desire to conserve restricted resources is the likely brain response thus leading to more reluctance to think and contemplate generally, less likely to think outside the box etc.